South Africa is one of the most prominent wine-producing countries in the Southern Hemisphere. With more than 300 years of winemaking history, it is often described as bridging the gap between the Old World and New. The majority of wines are made using New World winemaking techniques but often have more in common stylistically with their Old World counterparts. Vines were first planted in South Africa by Dutch settlers in the 1650s, although wine production did not really begin to take off until French Huguenots arrived with viticultural skills and knowledge in the 1680s. South Africa’s oldest wine estate is located in Constantia, where the production of the legendary dessert wine Vin de Constance gave the region worldwide fame in the 18th and 19th centuries. Stellenbosch is equally historic as a wine-producing region, the first vineyards having been planted here in the 1690s. 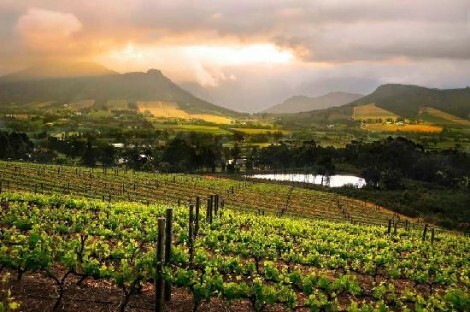 South Africa’s wine industry is distributed around the lush, rugged landscape of the Western Cape. Here, the abundance of mountains, valleys and plateaus allow winemakers to produce a diverse range of styles. Vineyards are also found in the Northern Cape’s Orange River region, where the flat, barren landscape is dominated by the Kalahari Desert. Most of South Africa’s wine-producing regions have a Mediterranean climate, significantly influenced by the meeting of the Atlantic and Indian Oceans. The country’s signature variety is Pinotage, a crossing of Pinot Noir and Cinsaut that is rarely found in any other wine-producing country. Shiraz is widely planted also, as are Cabernet Sauvignon and Merlot. Chenin Blanc is the republic’s most-planted grape, and South African Chardonnay and Sauvignon Blanc have become popular internationally in recent years. 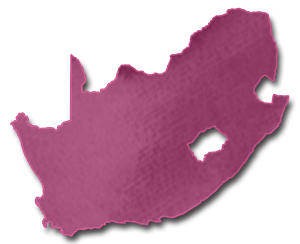 Today, South Africa is the ninth-largest producer of wine in the world, with some 100,000 hectares (250,000 acres) under vine. More than 250,000 people are employed in the industry and South African wine has enjoyed international attention and acclaim for its wide variety of styles.